During the global financial crisis, excessive debt was the principal disease. It also turned out to be the principal cure. That a cure could be worse than the disease was well known. But that the cure could be the same as the disease — that seemed to be something new and rather puzzling. It is also a comical fact of life in the 21st century that instead of retiring their student debt, some Americans are retiring with their student debt. Who saw that coming? There is an Urdu saying that cautions against excessive consumption: First you eat the food, and then the food eats you. It applies to the debt situation as well. 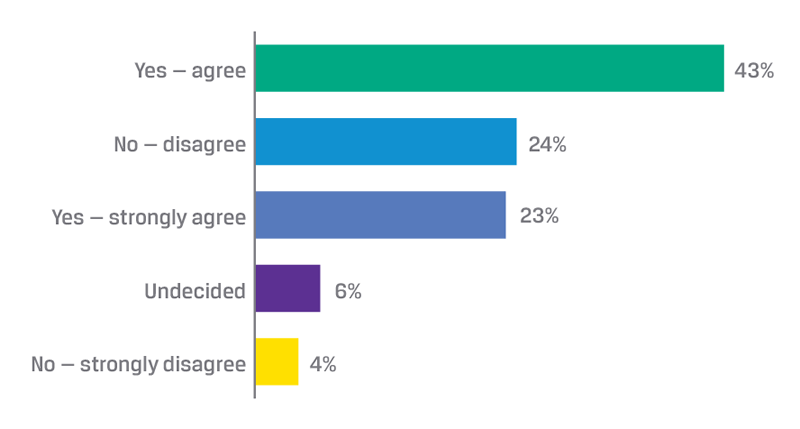 When we asked readers of CFA Institute Financial NewsBrief if global debt has become unsustainable, the majority (66%) of the 681 participants concurred. While there clearly were those who disagreed, interestingly, the smallest proportion of respondents (4%) was composed of those who strongly disagreed. We can keep looking for more data points, but the conclusion remains the same: The world seems to be pushing the limits on debt. How much is too much is an interesting but ultimately academic question — as the survey suggests, whatever the limit is, we are past it. Don’t get me wrong. Debt is an integral and inevitable part of our financial lives. But it brings with it a number of loaded questions. Is increasing global debt making the world economy more fragile, hindering economic growth, and contributing to inequality? Have you ever wondered why equity isn’t held responsible for such problems? What’s different about debt? Debt is a curious contract. The lender must be paid in full regardless of the outcome for the borrower. It is a contract meant for good times. But that’s not life. How can there be a fixed return in a world where uncertainty is the only constant? It can only work if unpaid debts don’t threaten the whole system. But under the current financial structure, we are far from such a scenario. We have too much debt and too many financial institutions that are “too big to fail.” The borrowers must pay the debt or the taxpayer will have to step in, with the increasingly familiar privatization of profit and socialization of losses, if not austerity, protests, and baton charges. Alas, discussion on this fatal contractual inflexibility is unlikely to be found in textbooks on finance and economics. One reason we have too much debt is that economists have continued to produce theories that favor debt over equity. These theories suggest that unlike equity, debt reduces the problems of adverse selection and moral hazard caused by the information asymmetry between financier and borrower. It requires less monitoring, lowers transaction costs, and has favorable tax implications. More importantly, debt has been entrenched in the global financial system through fractional-reserve banking. It is so entrenched, it has become hard to differentiate between money and debt. Damn you all to hell, you have screwed our future generations by your greed and stupidity. Thanks for visiting Enterprising Investor and sharing your gloomy comment. That’s a kind assessment, thank you Frasat. Interesting ideas and interview. A good place to start would be to eliminate the tax deduction of mortgage interest, but we have already seen the political impossibility of that. On the other hand, the U.S. is in such desperate need of corporate tax reform, perhaps debt and equity could be put on more equal footing in that context. However, the Congress is going to need more education like this if it is ever going to happen. Yes, there have been some interesting ideas discussed for some time about how to get better debt-equity balance, but we haven’t seen any progress. These things take time and perhaps crises to develop. Thanks for visiting our blog and sharing your views.